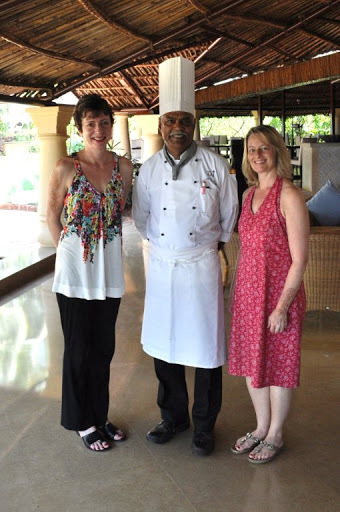 Thank you Kerala Tourism for asking me to update Nancy’s India Blog with three of your photos! 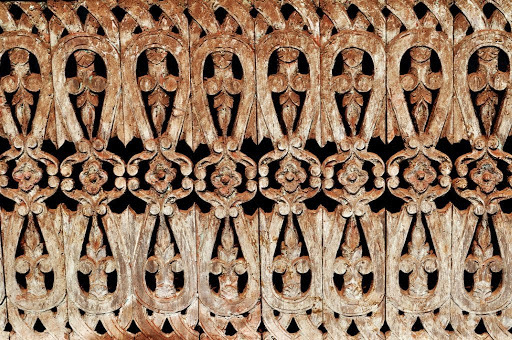 Travelers and nature lovers from across the world travel to the Kerala Backwaters to see a quieter, more serene side of India. 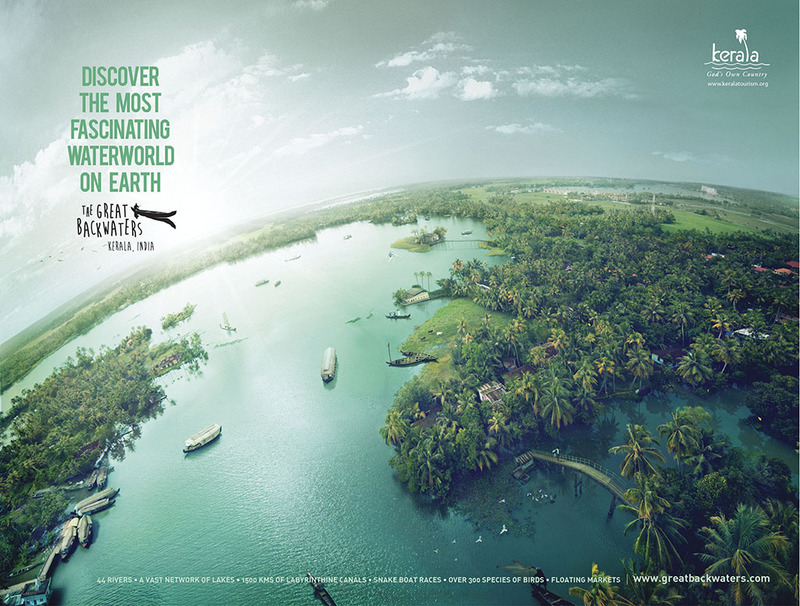 The backwaters are comprised of 44 rivers, a vast network of lakes, and 1500 km of labyrinthine canals. 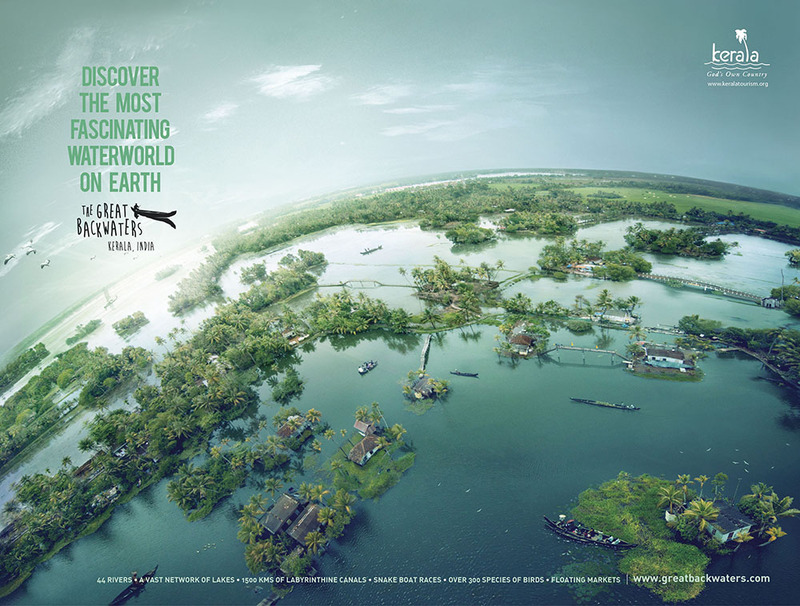 There are over 300 species of birds, floating markets and the famous snake boat races. 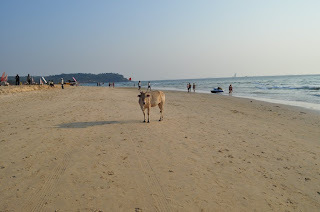 Click on Nancy’s India Blog to read about my trip to Kerala and to see the photos as part of the blog. 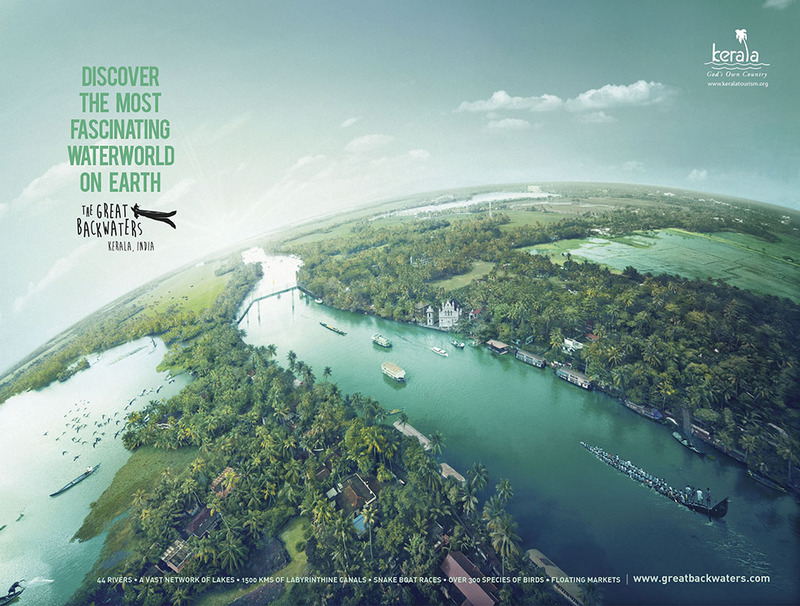 Click here to see an enlarged version of the photos and scroll through the backwaters. Sunday morning we were woken up at 6:00am for our morning boat safari. None of us were really into it but we dragged ourselves out of bed and made our way down to the boat. It was a calm and beautiful morning. We saw the odd bit of wildlife here and there: lots of interesting birds, lots of deer grazing along the shoreline, a couple of really cute otters and even a crocodile. We had our binoculars with us which kept the kids entertained for the full two hours and everyone really enjoyed the trip. Back on shore we had breakfast and packed up ready for the long drive home. Our driver managed to speed as much as we would allow (a bit nerve racking) and he got us to the outskirts of Bangalore in only four hours. A big bottleneck as always getting into the city where we stopped at Hard Rock Cafe for a break and our usual nachos, burgers and margaritas. Back home we remembered that it was Easter (an unusual way to celebrate) and the kids were thrilled to find a huge Bliss chocolate easter egg waiting for each of them in the fridge. 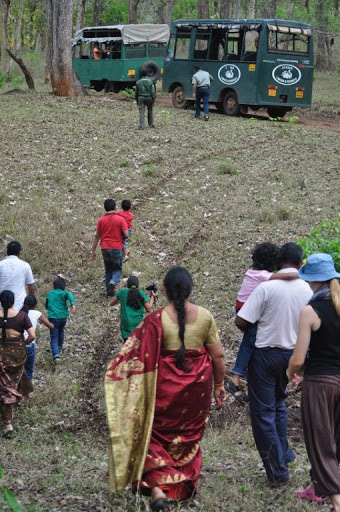 All and all we really enjoyed Kabini. 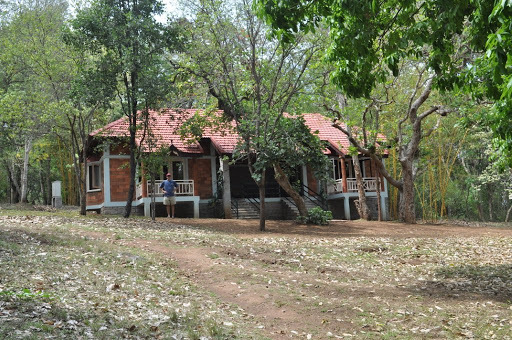 The people at Kabini River Lodge were friendly and accommodating, the safari’s were entertaining as long as ones expectations are not too high – it’s India, not Africa – no open plains with unlimited numbers of animals. 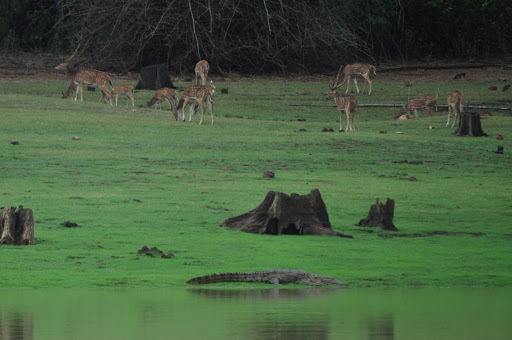 But really nice to see a quiet and calm part of India out in the wilderness. 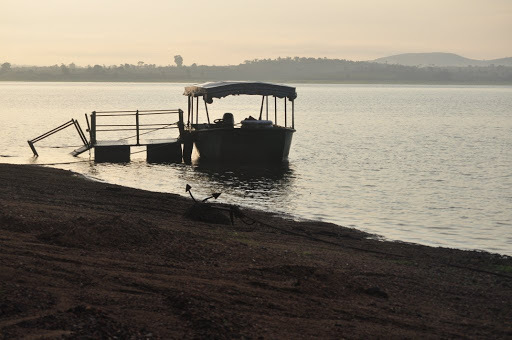 It took two hours to drive from Mysore to Kabini River Lodge where we stayed. Not a bad drive, nice to get to the rural areas and villages. Just the last 10 or so km were full of potholes so slow going. 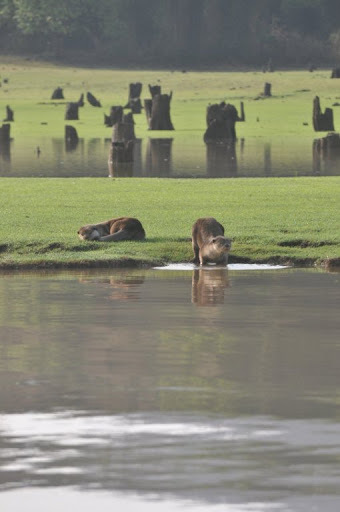 Kabini River Lodge had a great feel to it right away – wilderness, trees, a clean river! 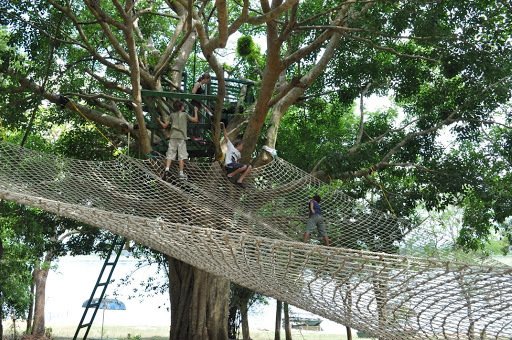 They have a network of nets strung up in the trees and a treehouse for the kids to play in. Alanna and Craig were excited right away when they saw this and off they went to climb and explore. As an added bonus some friends from school were there so the kids got to hang out and play. There is a set program for the weekend and the price includes a buffet lunch, dinner, breakfast, a jeep safari in the afternoon and a boat safari in the morning. We set off on the jeep safari in a vehicle that resembled a small bus rather than a jeep with about 15 of us in it. 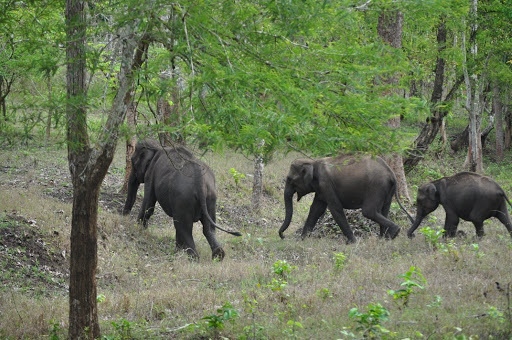 The first sighting was three elephants crossing the road. 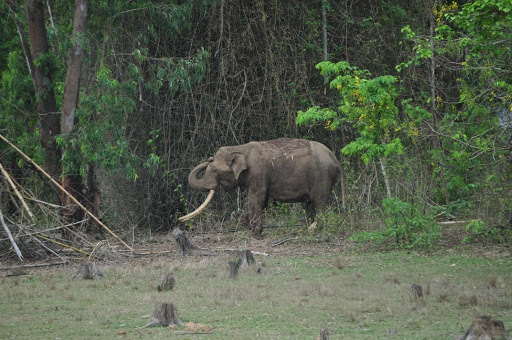 We saw a few more elephants, including one big one with tusks, some wild boars, lots of deer (spotted and sambar) and monkeys. There are tigers and cheetahs in the park but none that we saw. The park is treed, and the roads windy and bumpy. With the rains lately one section that dipped down had washed out – the vehicle ahead of us got stuck but eventually made it out and up the hill on the other side. Our driver decided to go off the road and bypass the section but it meant going over a bit of a ledge to get to the other side. I opted to get out and walk rather than take the chance of rolling and everyone else agreed. With about half an hour to go it started to rain…and then it started to pour…and then it was definitely a monsoon rain. The plastic sides came down and there was no view at all, the driver could barely see in front of him. Made it back but then got drenched running from the “jeep” to the cottage. Waited out the rains and then Michael and I made our way up to “John Wakefield’s Bar,” for G&T’s; such a civilized way to end a day out on the hunt. 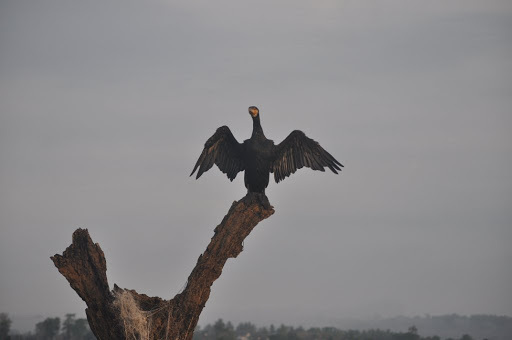 One last roadtrip – this time to Mysore on Friday and Kabini on Saturday and Sunday. We left at 11:00am Friday morning and it took four hours to reach Mysore via the Mysore Highway. Have to say the NH209, the rural highway to Mysore, was much more pleasant (see Aug. 9, 2010). This highway was busy and far too many speedbumps constantly slowing you down. Got to Mysore at 3:00pm and grabbed a bite to eat at the hotel restaurant. This was our fourth time staying at the Regaalis Hotel in Mysore – 3 star, reasonable rates, friendly staff, and a good restaurant. 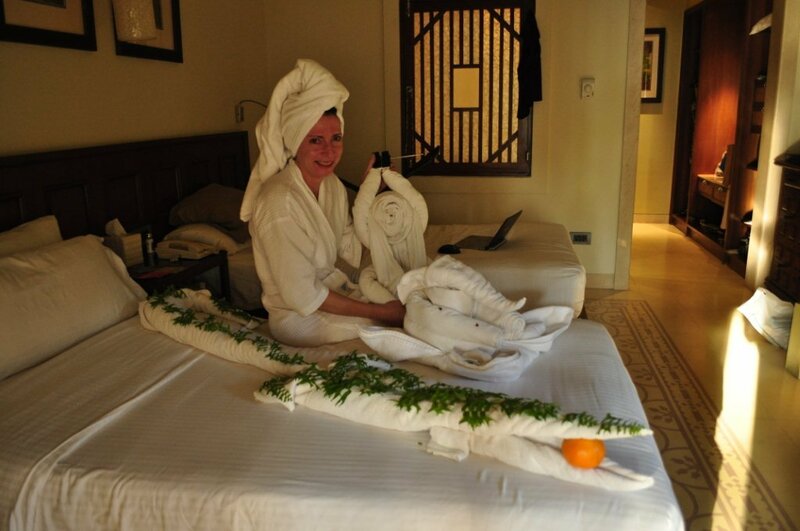 The rooms are big enough for the four of us but do ask for one of the renovated rooms as they are nicer. 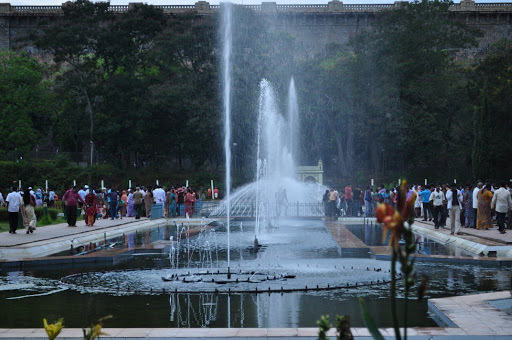 We had seen the palace, the market and Chamundi hill on previous trips so this time we decided to venture out to Brindavan Gardens where in the evening the fountains are all lit up and apparently there is a light show. So off we went at 5:00pm. The receptionist said it would take 20 minutes but it took at least 45min. along a narrow road full of potholes. We couldn’t believe the cars and tour buses in the parking lot – it was packed. It was very pleasant walking through the gardens and fountains. 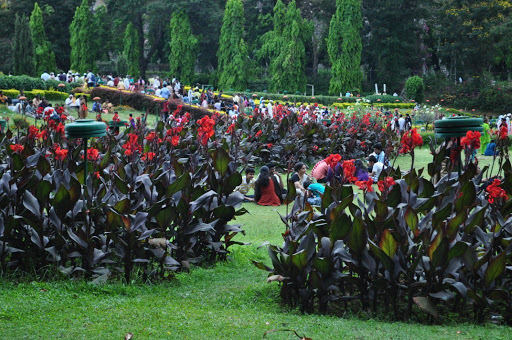 There is always a sort of festive feel when lots of Indian couples and families are out enjoying some leisure time together. The gardener may have been on holidays though as we noticed a lot of lawn mowing and dead heading to be done. 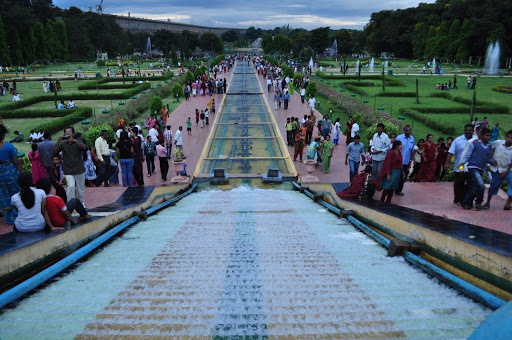 On one side of the gardens the Cauvery Dam looms overhead. 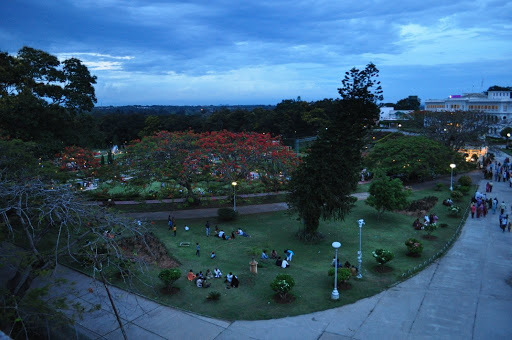 There are steps leading up to it and we got a great view overlooking the gardens to the east and the Cauvery River and the sunset to the west. Way in the distance, on the other side of the gardens we noticed an amphitheatre and figurered out that the fountain/light show would be way over there. 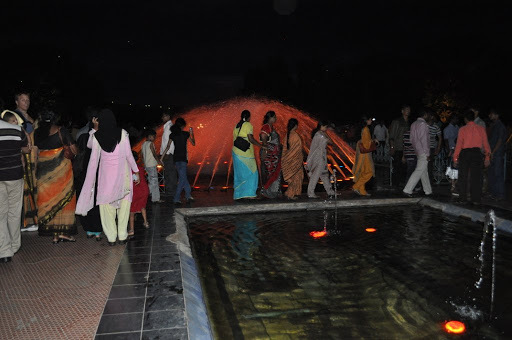 We made our way down the steps as the lights came on and the fountains were lit up – very nice. But to get to the amphitheatre you had to cross a narrow causeway over the water or go by small boat. Neither were appealing and both were packed. Plus what would happen once the show was finished?Everyone had to come back via boat or causeway. We decided to skip the light show and made our way to the parking lot. Found the van and headed off to the one exit and the narrow road. We couldn’t help but notice the parking lot was like a big ferry lineup with rows and rows of vehicles – but the difference was every third or fifth car was facing the opposite direction. I couldn’t imagine the chaos at the end of the night. And this happens every single night – I really think the Mysore government could put a little money into a new road with a few more lanes. It must have taken hours for those people to get out of there. 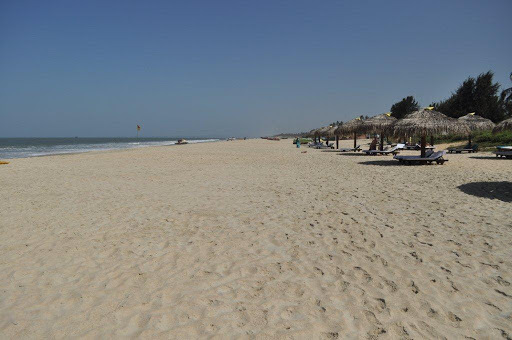 This time in Goa we went south and the beach was beautiful – nice soft sand, clean, long, warm water, great waves and not crowded at all. 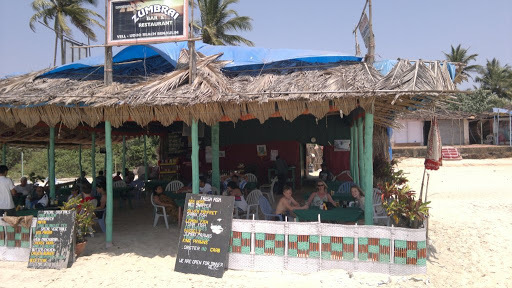 The days were spent lounging on the beach, playing in the waves and eating at our favorite little beach shack: Cafe Zumbrai, just next door to the hotel. We stayed at the Taj Exotica which I would not recommend. Overall the service was poor – we heard the word “No” far too much – and the food was overpriced and unappetizing. 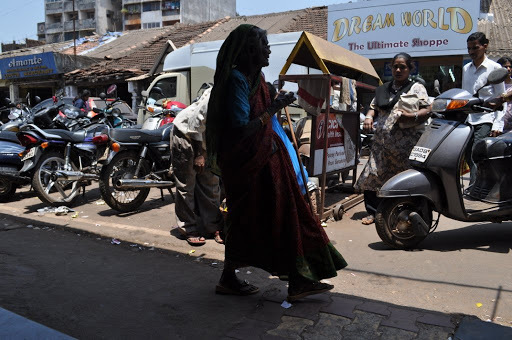 There were some good points such as housekeeping, the Goan restaurant and staff, and the breakfasts. 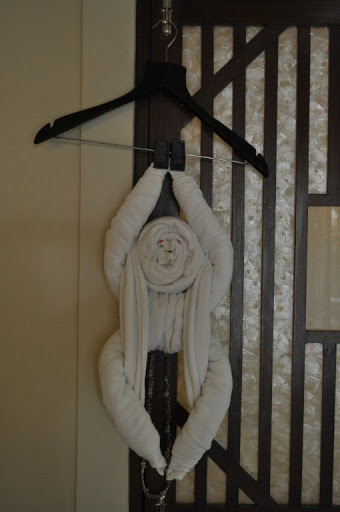 Generally at these “expensive” hotels you are paying extra for service and facitllities – this time, unfortunately, it didn’t pay off. So we just had our breakfast at the hotel and then off to the beach for the day. Lunch and dinner we gladly walked the hundred meters down the beach to Cafe Zumbrai where we ate fresh fish, all the Goan specialties, pasta, cheap beer and cocktails too! All in all (despite the hotel), we had a great family vacation with lots of sun, sand, surf and good food. 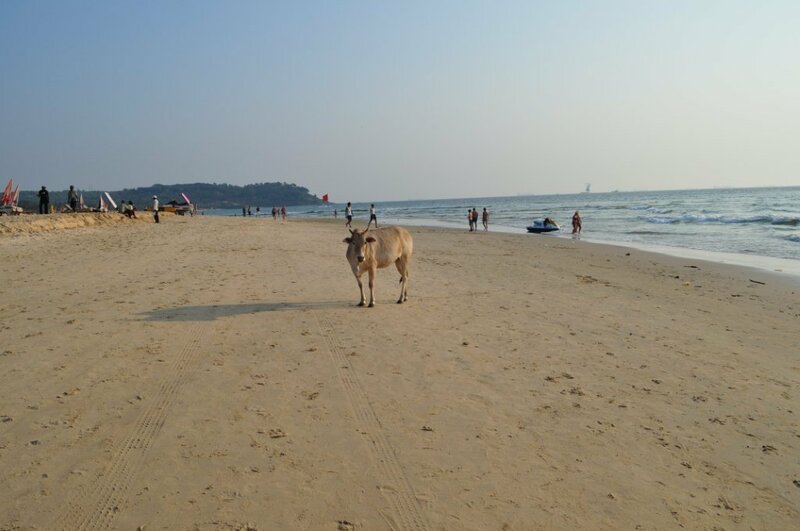 We went to Goa for springbreak. 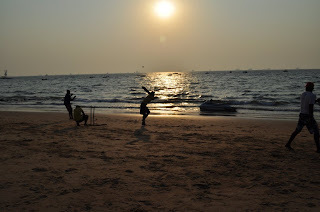 Whereas my last trip to Goa was all about cooking, this one was all about the beach, the waves, and a day walking about Margao. The kids weren’t too thrilled to give up half a day at the beach to walk around this busy little town. 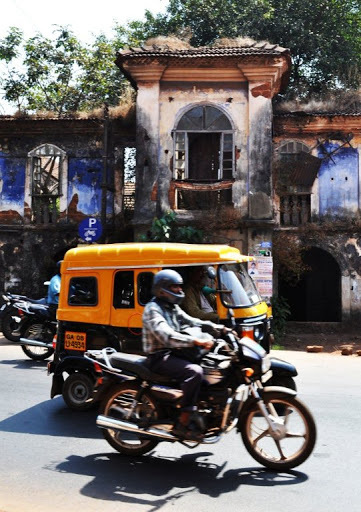 But what the heck, a little Goan architecture and street life never hurt anyone. 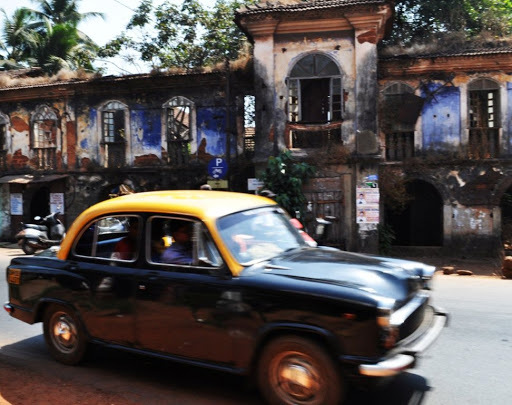 I just loved this stretch of the road with that fabulous old building in the background. Wow, look at the dried chilies! 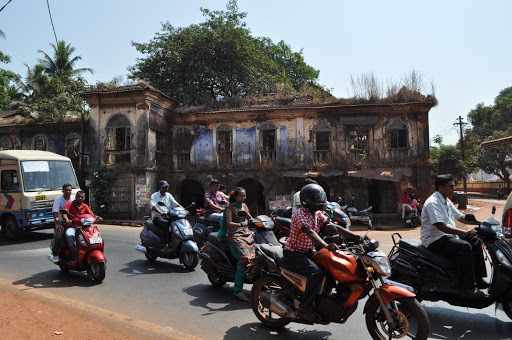 Our focus was on cooking but what about the rest of Goa? 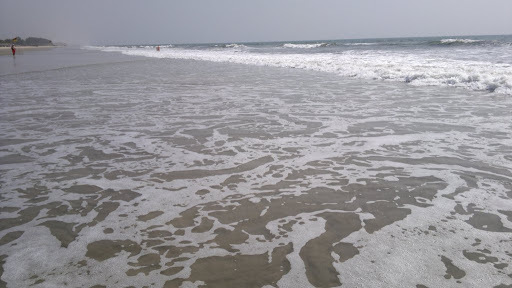 We only made it to the beach once – long and sandy and it went on forever. We went for a nice walk at sunset. 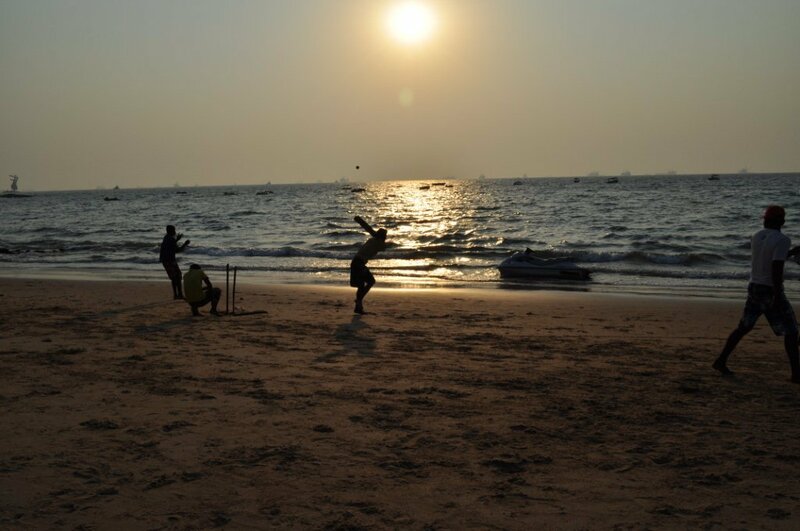 Very quiet with just a few locals playing cricket at our end of the beach. Then as we rounded the corner it became busier and around the next bend I thought I’d gone through a time warp – back to my backpacking days or to Waikiki, one or the other. Tons of people, shoddy lounge chairs with umbrellas and lots of characters strutting around. Some of these people must have arrived in the 60’s or 70’s and never left. Others looking like the mafia and of course the locals trying to sell their wares and the odd cow just hanging out. Apparently the Russians have invaded. 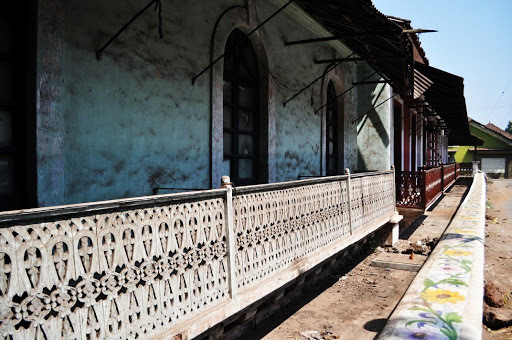 So many Russians are holidaying in Goa that signs have popped up in Russian and locals are even learning the language. The locals all said the same thing though – the Russians are cheap, they don’t spend any money. As for the countryside it is very pretty and lush. Lots of rice fields and palm trees. 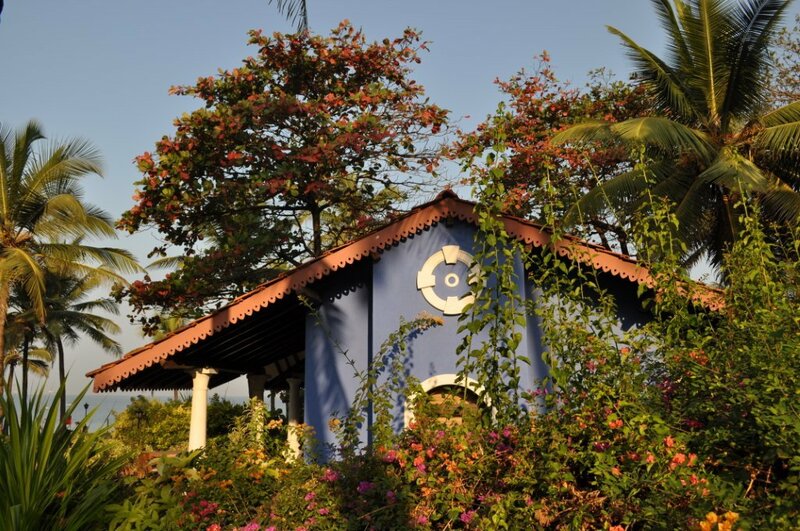 The architecture is interesting with Portuguese influence and many churches as Goa has a high Christian population. Friday morning Gail and I met with Master Chef Urbano de Rego. Chef Rego grew up in Goa and although he has travelled the world and cooked many types of food, Goan cooking remains his specialty and passion. Semi retired after a 41 year career with the Taj Hotels, he still consults. He has cooked for such dignitaries as King Hussein of Jordan, Henry Kissinger, Pierre Elliot Trudeau, the Shah of Iran, George Bush Sr., and of course an enormous list of India’s jet set and politicians. The man himself is as humble as can be and he readily sat with a couple Canadian foodies and imparted his knowledge upon us. We sat outside at the Beach House, the restaurant that serves Chef Rego’s Goan food. 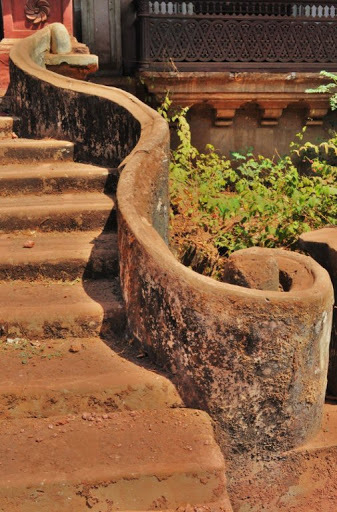 He showed us a traditional earthenware pot, still used today in Goan homes for cooking over fires of coconut husk, twigs and wood. 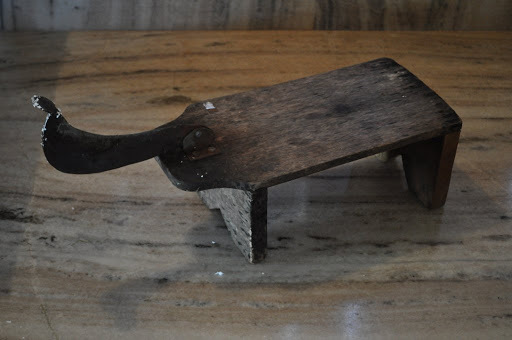 A coconut shell spoon is used for stirring. It was clear by listening to Chef Rego that he regards Goan cooking and Indian cooking very differently. Uses fresh spices, ground with a hand grinder, not a machine. 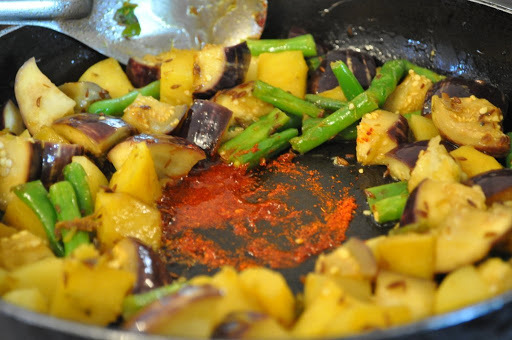 Indian cooking uses spice powder. Is cooked the authentic way in clay pots on charcoal. Fresh water from the well is used, not the tap. 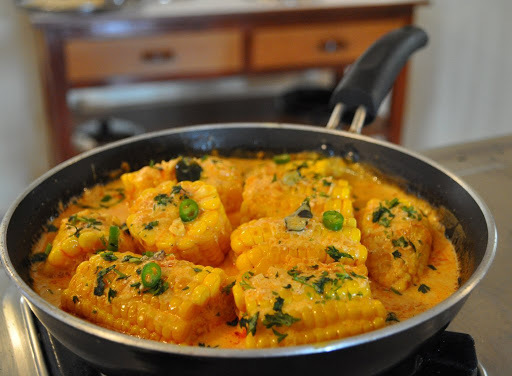 Seafood is bought fresh and put straight into the curry; it is often not even put in the fridge and never into the freezer. the thickening agent is coconut. 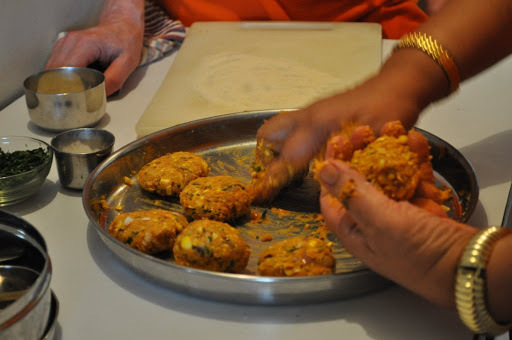 Indian cooking uses cashew nuts, tomatos, and onions as some of the thickening agents. uses a lot of palm vinegar. 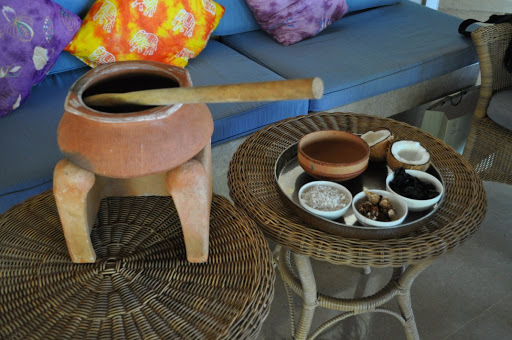 Indian cooking uses tamarind and kokam. Chef Rego says, “Anyone can become a ‘food wallah. '” It is “25% God’s gift, 75% hard work.” Never having been to cooking school, Chef Rego had to work extra hard. He started out as an apprentice at the Taj Bombay and rose through the ranks emerging as one of the foremost experts of Goan cuisine. 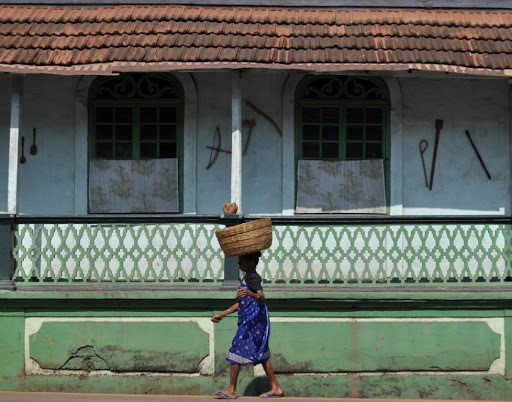 The Portuguese left a lasting influence on Goan cuisine. Chef Rego went into detail about the foods that were introduced with the Portuguese – in particular pork, beef, chicken and mutton (in that order). The word vindaloo comes from ‘vin’ for vinegar, and also from ‘albo’ which is Portuguese for garlic. 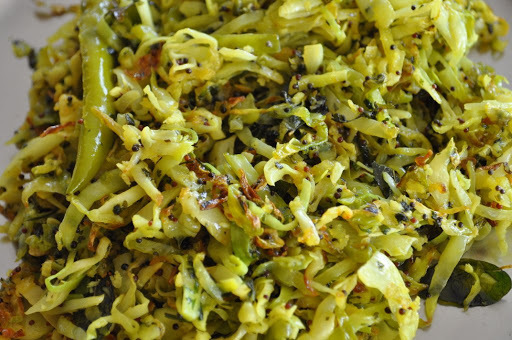 A fiery Pork Vindaloo is a favorite. 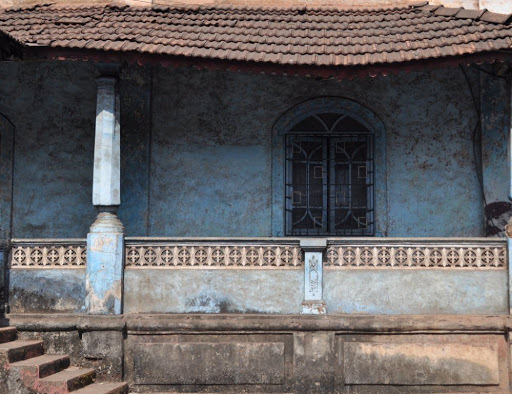 We were surprised to learn that salted tongue, pork and homemade sausage are readily served in a Goan household. The Portuguese bread “Poie,” leavened with toddy was another important contribution. 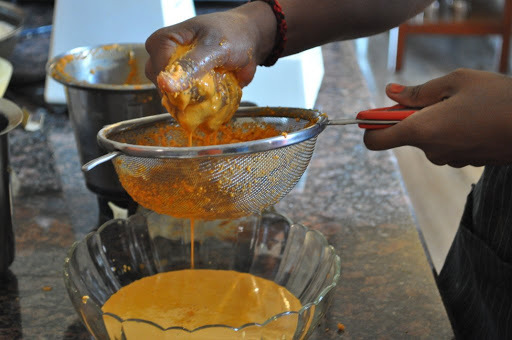 The Portuguese brought with them a recipe for Galinha Piri-Piri (Chicken Piri Piri) from Mozambique. 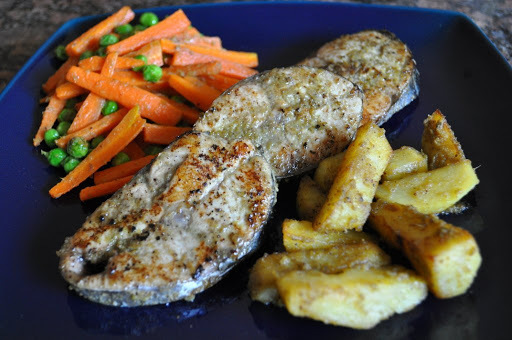 The Goans substituted some ingredients and fried it rather than grilled it and it became Galinha Cafreal (Chicken in Toddy Vinegar), a Goan specialty. 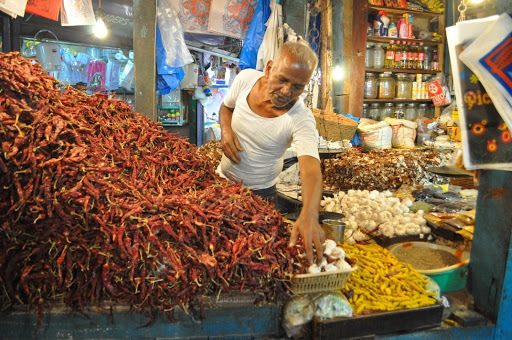 Even dried red chilis which are now a staple in Indian cooking came from the Portuguese via the Americas. 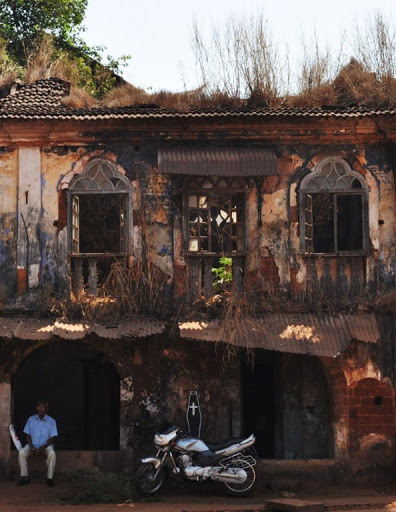 From his mother’s kitchen Chef Rego learned the tastes and traditions of Goan cooking. Throughout his career he incorporated her recipes into his own creations. Cooking should “come from the heart, cooking is an art,” he says. Still, his favorite place to be is in the kitchen teaching and working with food. The menu may seem a little odd but there was a reason behind it. As I mentioned Gail has been contributing recipes for an online magazine called Spezzatino. Each issue has a theme and the upcoming issues are nuts, eggs, and corn. Gail had asked Judy to come up with some recipes that could be used in the magazine. Plus we wanted to learn how to make Masala Chai so she threw that in for us as well. 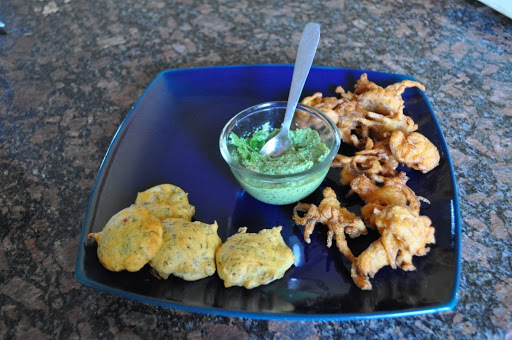 I would have to say that the corn cutlets were really good – something I would want to make at home. The other dishes were so-so. To be fair the recipes were modified to accommodate Gail’s requests and I would try a couple of them with the original ingredients. For instance the Xacuti is usually made with mutton or chicken and the egg curry with fish – meen kari (fish curry from kerala). The turka dal we made on the first day was so good, I wouldn’t bother making this dal again. 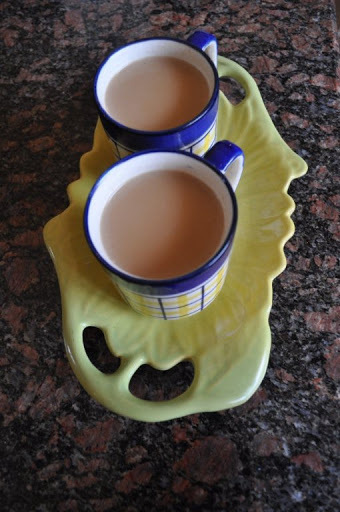 I was glad to finally learn how to make masala chai. Judy was quite interested to hear that in the west we have tea bags of “Chai tea” – which she pointed out doesn’t make sense at all since chai means tea = “tea tea.” Masala is the blend of spices used: cardamom, cinnamon, cloves, and peppercorns. Add to the milky water, and yes, steeped with real tea and the outcome was an aromatic and flavourful masala chai. This was our fourth and final day of the cooking school. 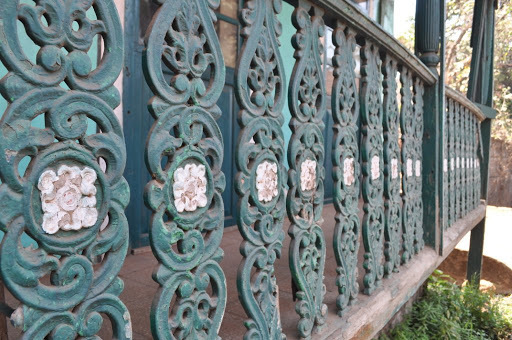 Normally it is five days but we chose to go to the market and spice plantation in one day instead of two. Plus we were looking forward to our meeting with Chef Rego on Fri. (more about that next post). Judy was so full of knowledge and we came home with a lot of great recipes and notes. Both Gail and I agreed it was well worth it. The cooking area was a good size, with lots of cooking vessels and very pleasant surroundings right on the river. Recommended! Here you can see Shoba using a traditional ‘Adao’ to grate the coconut. The only problem was that we were making all the dishes at once – now I can’t even remember which dish the coconut was being strained for – Prawn Curry or Coconut Chutney? I would work on one dish, Gail another and then Judy would call us over to show us something else. It was fine and everything got done with Judy coodinating. As I look at the photos I think it was for the prawn curry.